If you are tired of your skinny and thin body frame, working out in the gym is a good start. But exercise is just one part of the equation – you also need to feed your body with the right balance of protein and carbohydrates which will get converted into lean body mass. Save yourself the trouble of preparing a whole meal, get complete mass-building nutrition with a serving of All Stars Ultimate Mass Gain! Being a hardgainer can be really frustrating, especially if you are trying to bulk up and grow more muscle mass. Ultimate Mass Gain brings together a precise combination of protein and carbohydrates, giving you all the nutrition you need to achieve a heavy, muscular physique – instead of thin, skinny body. Each serving of Ultimate Mass Gain gives you a giant-sized 40g of protein (Whey Protein Concentrate, Milk Protein Concentrate, Micellar Casein, and Egg White Protein) to force-feed your muscles with amino acids and nutrients that will get them growing and rebuilding in no time. This protein blend features both fast- and slow-digesting protein sources to ensure round-the-clock protein nourishment! You also get 97g of carbohydrates (D-glucose Monohydrate and Maltodextrin) which will supply your body with long-lasting energy and promote the transport of more nutrients to your muscle cells for maximum muscle growth and size! These carbs will make sure that your energy requirements are always met, and that you start your day with a full reserve of glycogen for exercise. Start the transition of being a lightweight into a bulked up heavyweight muscle machine. For convenient and complete mass-gaining nutritional support, all you need is All Stars Ultimate Mass Gain! Have a question about Ultimate Mass Gain? What is it, what does it do, how and when to use or something else? Ask us. 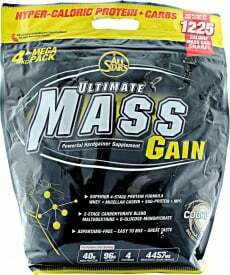 “Ultimate Mass Gain 1800g” is currently out of stock. Enter your details below and we will let you know when it's back in stock. Drink up to 3 servings daily, preferably with the breakfast, as a snack before exercise, immediately after exercise and / or at bedtime. Mix 100g (3 heaped scoops) in a hand mixer (shaker cup) or blender filled with 600ml whole milk (or 500ml of water). Close shaker and shake vigorously for 10-15 seconds and mix for 10-15 seconds with the mixer. WARNINGS Ultimate Mass Gain : Keep out of reach of children. Do not exceed recommended daily dosage! This supplement should not be used as a substitute for a varied diet.